in which shall be admitted all cars complying with the special regulations of Appendix “C” to the International Sporting Code as well as Touring and Grand Touring cars of a model recognised by the FIA, but which because of changes effected cannot be entered in one of the three above-mentioned groups (see art, 274). Recognitions will be granted by the FIA on recommendations of a sub-Commission appointed by the CSI called “Sub-Commission on Recognitions”. This Sub Committee shall be entitled to require any additional evidence it may deem necessary to enable consideration of an application for recognition. They will be circulated at the earliest opportunity by the FIA Secretariat. All competitors shall have to carry the recognition form concerning their model of car. Promoters will be entitled to refuse participation of a car in their event if said form is not produced at scrutineering. Competitors requiring a recognition form should apply to the CAN of the country in which model concerned is manufactured. a. with regard to the chassis and mechanical parts they shall be perfectly identical to a series-production recognized four-seater model. b. They shall have at least the same weight. c. At least 1000 units of the model must have been built in twelve consecutive months. The official weight of a car shall be entered on the recognition form of the considered model. This weight shall be obtained by taking the average of the actual weighing results of 5 closed cars of the same model, selected at random and weighed in the following conditions: with the spare wheel provided by the manufacturer and with a tyre which is the same as those mounted on at least two wheels of the vehicle, with full oil tank, and full water tank (if such is the case), but without fuel, tools, luggage or anyone aboard, less a tolerance of 3 per cent. No modifications and/or additions may be brought to a vehicle as it is supplied by the manufacturer and described on the Recognition Form, whether they affect mechanical parts, material or aspect, internally as well as externally, beside those authorised under the present article. Any modification and/or addition not explicitly authorised under the present article would entail the assignment of the car to another of the following groups—according to the nature and importance of modifications and/or additions—as defined in the present regulations, or its exclusion from the event, should there not be an applicable group in the supplementary regulations of the competition. Any change and/or addition not specifically authorised by these regulations shall be drawn attention to in writing by the entrant under pain of exclusion or higher penalty in the case of wilful misrepresentation. (1) Lighting devices: make and number are free, provided they comply with the International Convention on Road Traffic. (4) Carburettors: The carburetor(s) normally supplied for the recognized model and described on the Recognition Form may not be changed or modified. The jets may however be changed and the hand-control of choke substituted to an automatic one (or vice-versa). (5) Battery: the tension (voltage) may not be changed, but the make, type and capacity (amperage) of battery and generator are free as well as their attachment system provided the method for driving the generator and the location of battery are unchanged. By location of battery is meant the compartment of the coachwork in which the battery is originally mounted. The replacement of the dynamo by an alternator is authorized provided the original attachment to the engine is retained. The location of all electric cables is free. (6) Ignition coil, condenser and distributor: are free, on condition the ignition system remains as provided by the manufacturer for the considered model. A spare coil and/or a spare condenser may be set up anywhere provided the switching from main to spare cannot be controlled from the inside of the car. The replacement of an automatic control of the ignition by a hand control (or vice-versa) is authorised. A transistor type of ignition system is not allowed unless it is specified on the form of recognition. (8) Petrol pump: a mechanically controlled pump may be replaced by an electrically controlled one and vice-versa. The number of petrol pumps simultaneously coupled to the fuel feed system may not be increased. (9) Reboring: is authorised on condition not to exceed the original bore by more than 0,6 mm. Moreover, the resulting increase in capacity must not be such as to make the car pass into the above class. The make of pistons is free as well as their basic material, but they shall be identical (except for their inner ribs) to those provided by the manufacturer for the model considered and shall have at least the same weight. In particular, the shape of the crown, the location of the axis, the number and type of rings may not be modified. The type of ring is defined by the function for which it is intended: top ring, compression ring or oil cutter ring. When the engine has removable sleeves, the replacement of pistons is authorised in the same conditions as provided here above, that of the sleeves is also permitted provided the replacement sleeves are identical to the original ones and in particular their basic material is the same. Moreover, engines with removable sleeves shall enjoy the same re-boring tolerance as provided for sleeveless engines. (12) Shock absorbers: the make and type are free but neither their number nor their system of operation, nor their system of attachment, may be modified. By system of operation is meant: hydraulic or friction shock-absorber, of telescopic or lever type, regardless of the mechanical resultants of these different systems, such as for instance whether the device has a double-¬acting or a simple-acting effect, and in case of hydraulic shock-absorbers whether there is or not an additional gas chamber. (13) Wheels: must be of a type provided by the manufacturer and specified on the recognition form. One basic series may comprehend wheels of different types (solid or perforated disc wheels, spoke wheels, etc.). Even though the recognition form shows wheels of different dimensions, all four wheels in use must be of the same diameter. Whenever a spare wheels is provided by the manufacturer, such a spare wheel equipped with a tyre as fitted to one of the other wheels of the car shall be carried in the competition in the position provided by the manufacturer and shall be securely fastened in that position. Wheels may be balanced. (15) Brakes: any system improving the cooling or increasing the safety of the braking system is authorised, such as for instance the fitting of special air-pipes (provided the body as defined in Art. 258 is not altered). The fitting of a dual pump or any type of device providing both a simultaneous action on the four wheels and a divided action on the front and rear wheels is authorised. 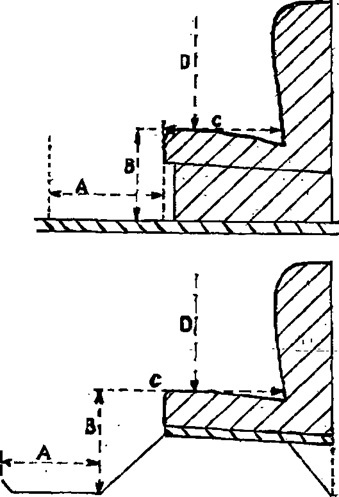 The make and attachment system of the linings is free, but no other change is authorized: particularly the dimensions of friction surfaces must remain unchanged. The location of all brake pipes is free. (16) Supplementary accessories: all accessories likely to improve the operation of the vehicle, the comfort of its passengers or the safety are authorised, provided they have no influence whatsoever on the mechanical performance of the engine, the transmissions, the road holding and the braking (except if explicitly authorised in this same article). However no part or accessory normally provided by the manufacturer for the model concerned may be removed or replaced except the steering wheel. (17) Coachwork elements: The only elements of the coachwork which may be changed are as follows; windscreen, door, quarter-light and rear windows, front-seats, steering wheel, shape and length of the gear change lever, and shape and size of control pedals. The only glasses authorised when replacing the windows etc. supplied by the manufacturer are safety glasses to the exclusion of plastic. No other coachwork element may be removed or replaced except as provided by article 18. (18) Bumpers, embellishers, stream-lining: The bumpers are compulsory on all cars for which the manufacturer has normally provided them, when they are racing on open road. For races and hill climbs on closed circuits the Supplementary Regulations may authorise or prescribe the removal of bumpers, failing which said bumpers shall remain. Wheel embellishers may be removed as may external coachwork embellishers with the exception of those surrounding lamps and the radiator grille and always on condition that no sharp corner or projection become exposed. The addition of any protective device for the underneath of the car is forbidden unless such a device is mentioned on the recognition form for the model in question or is authorised or made compulsory in the Supplementary Regulations. In addition to the 18 latitudes granted for cars of Group 1, the following changes and extra equipment are authorized for cars of Group 2. Any modification and/or addition not explicitly authorised hereafter shall entail the exclusion of the car from Group 2 and its assignment to another of the following groups provided for in the present regulations, or its exclusion from the event, should there not be an applicable group in the Supplementary Regulations of the competition. Any change and/or addition not specifically authorised by these regulations shall be drawn attention to in writing by the entrant on a statement enclosed with his entry form under pain of exclusion or higher penalty m the case of wilful misrepresentation. (19) Wheels: may be of a different type than the one or those provided by the manufacturer provided the hub remains unchanged as well as the dimensions of the rim and of the track provided and stated by the manufacturer. Wheels, including their attachment system may be reinforced, even if this entails a change in the attachment system, the type of which must nevertheless remain unchanged. (21) Stabiliser: the fitting of a commercial suspension stabiliser or equivalent device is authorized. 1) The make, number of chokes, jets, throttles and all details of design and operational principles remain identical with those of the carburetor(s) specified on the Form of Recognition for the model concerned. 2) The carburettor(s) may be fitted using the original attachment bolts or studs and holes and without any intermediary piece. (24) Springs of any kind (valves, clutch, suspension, etc. ): They may be replaced by other ones of unrestricted origin, but without modification of the number provided by the manufacturer and on condition they can be fitted without any alteration of the original supports. (25) Pistons and Camshaft(s): All modifications of pistons are permitted. Their shape may be altered and they may be lightened or replaced by other pistons supplied or not by the manufacturer. Camshaft(s) may be altered or replaced by other ones supplied or not by the manufacturer, subject to the maximum lift of the valves not exceeding that specified by the manufacturer and stated on the recognition form of the model concerned. (26) Finishing off: all perfecting operations by finishing or machining the original parts but not their replacement except with regard to carburetors, piston, camshafts and springs as specified here-above. In other words, provided it is always possible to ascertain unquestionably the origin of the series production part, it may be rectified, balanced, lightened, reduced or modified with regard to the shape through tooling, to the exclusion of any addition of material or any mechanical extension or of any process involving a change of the characteristics of the molecular structure or of the surface of the metal. The increase of the compression ratio through machining the cylinder head or block, or using a thinner gasket or doing without one, is authorised. 1) it shall in no way interfere with access to the seats and normally occupying them. 2) It shall not encroach on the volume occupied by the driver or any of the passengers. 4) structure, that might influence its road-holding qualities. 5) The weight of such a structure shall be additional to the recognised weight of the car. (1) if the chassis is of self-bearing type, it shall be maintained and may be strengthened, but not lightened or cut. (2) if the chassis is not of self-bearing type, that is when the car has no chassis or only a partial or insufficiently bearing one, the body may be changed as a whole, but shall under its new shape compulsorily use the original attachment points on the series production elements of the suspension, propulsion and steering. In all the cases mentioned above the resultant coachwork shall present the appearance of being fully finished both externally and internally. When the vehicle is equipped with the wheels and tyres to be used in the competition and with fuel, oil and water reservoirs filled ready for the start of the competition and with the driver aboard it shall be able under its own power to pass over a template 80 x 80 cm. and 10 cm, high. However, the total capacity of the fuel tanks (main and auxiliaries, if such is the case) shall not exceed the maxima specified by Art. 269. Its back panel shall be entirely closed and shall offer a transparent section, providing good visibility behind, of the following minimum dimensions: width, 50 cm, height 10 cm.—measured vertically. Open or closed special bodies built in supplement to those required for the recognition of the car according to Art. 265 above shall be admitted if they meet the specification of Art. 264 (a) and (b) and Art. 270 above, provided the weight of the vehicle remains at least equal to that of the corresponding recognised car. Once there is an existing series of 100 units built within twelve con¬secutive months, offering the standard body and duly recognised, no minimum of construction is further required for a special body whether mounted by the manufacturer or by the entrant. (2) All cars which are not of a. recognised model but which comply with the specifications of Appendix “C” to the International Sporting Code. A new Appendix J, being completed at the time of going to press, is to be brought into effect in 1966.